If you follow the Kurdish question, you will know that last week the Human Rights Commission of the Turkish parliament approved the report of the investigation into the Uludere massacre. The work was carried out by a sub-commission, especially set up to investigate the events on the evening of 28 December 2011. The report fails in every way to reveal the truth about the massacre, in which 34 people were killed. 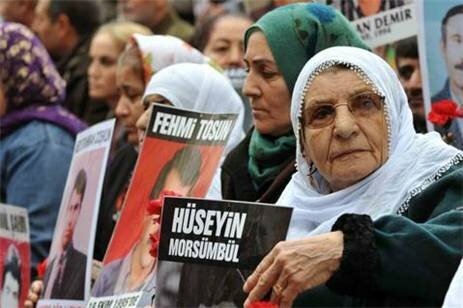 This failure is not only a betrayal of the victims and their families, but also an obstacle to peace in Turkey. The report states that the bombing was ‘unintentional’. It was caused by mis-communication between civil and military authorities, and by the ongoing ‘terrorist threat’ in the area. Nobody is held responsible. It was, in short, just an unfortunate coincidence. The only problem is: it wasn’t. Much more is known about the circumstances surrounding the bombing than the official report reveals. All the jigsaw pieces put together say: ‘Uludere’ was no accident. 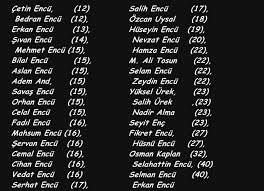 List of the names of those who died in the massacre. Click to enlarge. I became convinced of that during several shorter and longer visits I made to the two villages where the victims of the massacre came from, Ortasu and Gülyazi, in the district of Uludere. During all this time, the government has tried to frame the massacre as an accident, and more unbelievably, as an accident that the villagers brought upon themselves because they were smuggling goods in a dangerous area. It was even claimed that they were auxiliaries of the PKK. For the majority of the Turkish public, this explanation makes total sense. The smugglers were after all in an area where the PKK is also present and where the PKK often crosses the border to attack military targets in Turkey, and in the dark it must be hard to clearly identify a group of people. Of course, it’s unfortunate that a group of civilians accidentally lost their lives, but well, weren’t they aware of the risk of smuggling in that particular location? Many Turks don’t know the region very well and most of them have never visited it either. They are even afraid to do so, because the Turkish media has always painted a violence-only picture of Southeast Turkey, inhabited by ‘terrorists’. Believing the state’s version of the events in Uludere is convenient. It doesn’t shake their beliefs. Not those beliefs they have about the Southeast, and not the beliefs they have about the state, meaning that the state would never kill citizens on purpose. A little bit of logical thinking is already enough to make you question the state’s version of events. To start with: how can the Turkish army, with close to thirty years of experience in fighting the PKK, not distinguish a group of dozens of smugglers from a group of guerilla fighters? PKK fighters, like any guerilla group, don’t move around or carry out attacks in big groups of people, but in small units of eight to ten people at the most. Besides that, the smugglers were with mules, at least one per person. Yes, the PKK sometimes transports weapons on beasts of burden, but can you ever imagine them going about with at least fourty, fifty mules? Also, the smugglers have been using this route for decades for their trade. The military units in the area knew about it, and informed the villagers about planned anti PKK operations so they could postpone their smuggling. Doesn’t make sense? It does. Many of the people in Ortasu and Gülyazi are village guards, in other words auxiliaries of the army paid and armed by the state to help fight the PKK. The army knows which routes the smugglers use, and also that the PKK takes other routes – which guerilla force would ever use fixed routes in the first place? Then, there is the place where this happened. Two independent human rights organisations, IHD and Mazlum-Der, visited the exact location of the bombing the very next morning. In their report, they describe the area: the Turkish side is mountainous, while the Iraqi side is high, but flat. ‘Anybody approaching the border via that plain will be detected by Turkish soldiers.’ No logical route for a PKK unit to pass into Turkey at all. Banner shown at commemoration Uludere massacre, 28 December 2012. 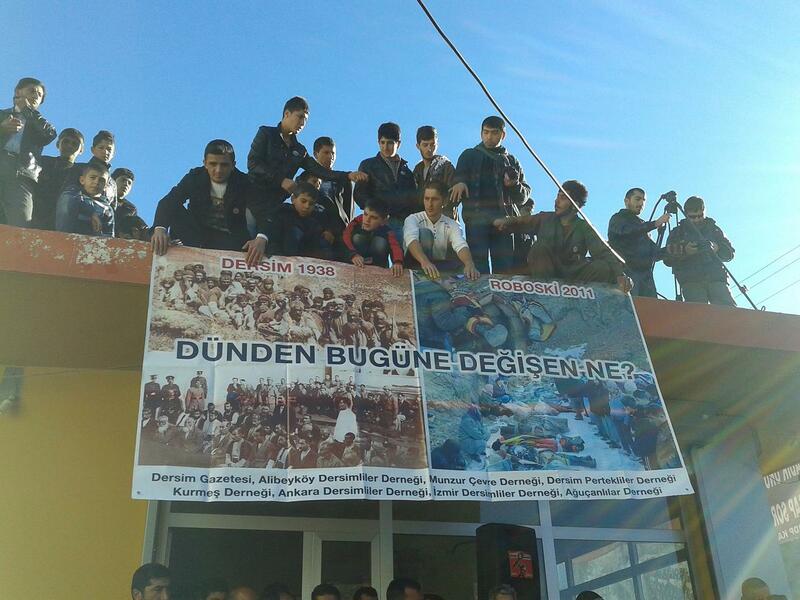 Dersim 1938, Roboski 2011, What’s the difference between yesterday and today? Pic by me, click to enlarge. The army itself confirms this in the (secret) report about the massacre from the Interior Ministry, which the Uludere investigating committee was allowed to read – but not copy or photograph. That is according to BDP MP Ertugrul Kurkcu, who is a member of the commission and who shares parts of the Interior Ministry’s report in his own alternative report. Military personnel are quoted as stating that the region is in fact ‘relatively calm’ and that there is ‘no terrorist activity’. The chief of the intelligence service of the police in the province of Sirnak, in which Uludere is located, claims: ‘According to our information the area concerned is not known as one where terrorists are active. It’s being used by smugglers’. So why did 34 men and boys have to die? This question has puzzled me for some time. Whenever I asked about it in the village, I got the answer ‘because we are Kurds’. But that version doesn’t make much sense either. Ever since 1938, when the state bombed Dersim province, the state hasn’t murdered a big group of Kurdish citizens on purpose. Why would they do it now, at a random place at a random time? The Uludere commission visited the region too, and talked to local army commanders. They stated that there was intelligence that a high PKK commander, Fehman Hüseyin, was present in the Iraqi part of the Haftaninregion, where the bombing took place. The army needed a success against the PKK, after 24 soldiers were killed two months earlier in a PKK attack in the neighbouring province of Hakkari. Right after that bombing, Turkish politicians swore to take revenge. That night, according to intelligence, Fehman Hüseyin might cross the border into Turkey. He might be hiding in a group of smugglers. The intelligence was weak, but enough for the army to take action. If the intelligence turned out to be right, the army could celebrate a victory over the PKK. The Kurdish citizens who died too could have been presented as collateral damage – if people had asked questions at all, because the villagers would be considered traitors. Only, the intelligence was wrong. Fehman Hüseyin wasn’t there. There were only smugglers. To cover up the careless way the state deals with human lives, immediately the next day the government started framing the massacre as an unfortunate accident. There is no solid proof, but this is, based on what is known, the most logical explanation of what happened on the night of 28 December 2011. All the relevant documents are stamped ‘secret’, none of the higher placed political and military decision makers talked to the Uludere commission. And the commission didn’t use any of the information that didn’t support the conclusion they were supposed to draw, namely that it was all an unfortunate coincidence. The commission consisted of five members of governing party AKP, and one of each opposition party, CHP, BDP and MHP. Only the AKP members accepted the report’s conclusion, the other three did not. That this is a betrayal of the victims and their families is obvious. But how does it hamper the peace process? In my opinion, it does that in two ways. The ‘Saturday mothers’ still don’t know what happened to their children, who disappeared in the eighties and nineties. Click to enlarge. One: it is crucial that Kurds start building their faith in the state again. They lost it totally after some hundred years of fierce repression. Revealing the truth about the Uludere massacre and punishing those responsible would help tremendously. Uludere is not an isolated case. If the truth about Uludere is acknowledged by the state, it may mean that the state will also seriously investigate the murders of the past. Dersim, for example, the brutal crackdowns on Kurdish uprisings in the 20th century and all the murders and disappearances of Kurds in the eighties and nineties. The truth must all come out, so reconciliation can start. Two: if the exact details of Uludere were revealed by the government and if those responsible were punished, the true face of the Turkish state would also be visible for all Turkish citizens. They couldn’t easily reject the course of events anymore by calling it ‘terrorist propaganda’. It will for sure be a shock to a lot of people to find out they have been lied to by the Turkish Republic that they love so dearly. But it would help the eventual healing of the whole nation. That the AKP isn’t brave enough to face the facts of the Uludere massacre in these times so crucial for the Kurdish issue doesn’t give me much hope for the outcome of the peace process. This blog post is based on a longer story I wrote about the Uludere massacre, which was published in the Netherlands last week. 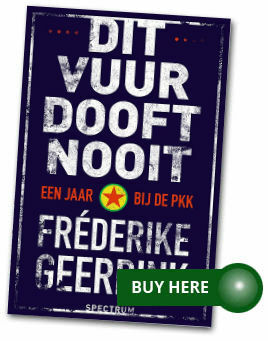 Read it here in Dutch. The English version isn’t available yet, since I am trying to sell it to an English language media outlet. I will keep you posted when it’s published!